Welcome to Hamilton-Wenham Integrated Preschool. The Hamilton-Wenham Integrated Preschool provides a safe and nurturing environment that promotes the physical, social, emotional, language and pre-academic development of children ages three and four years old. ​​Our goal is to prepare our preschool students for Kindergarten in one of our three Hamilton-Wenham RSD schools or area private Kindergarten programs. 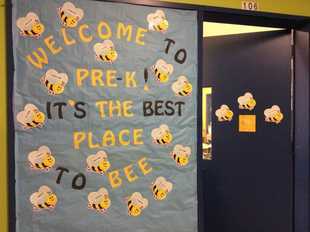 Welcome to the Pre-K! It's the best place to bee! Photo of Ms. Dagley's classroom door. The program is child-centered and incorporates developmentally appropriate activities and interactions across domains. We balance active and quiet experiences for learning and play, both indoors and outdoors. These experiences are designed to foster the development of the whole child. Expressive arts, including music, are a vital part of each week. What is an integrated preschool? ​The integrated preschool model provides inclusion of all children, those with special needs and those who are typically developing, with a well-structured setting and a rich, prekindergarten curriculum. Integration offers an ideal opportunity for children to work and play together, explore social relationships and develop self-esteem. Early literacy and mathematic skills are enhanced with a multi-sensory and thematic curriculum. Play-doh fun with Dr. Michael Harvey, Superintendent of Hamilton-Wenham Regional School District. Located in classrooms at the Winthrop Elementary School, classes are staffed by early childhood special education teachers, therapists and teaching assistants to provide a low adult to child ratio. Art in Ms. Moore's classroom. ​The Winthrop School supports and enhances a student-centered environment where each student can and will learn to be a productive citizen. We envision a school community where all members - students, staff, and parents are continual learners. A student-centered environment means that the focus is on the student's experience in the school community. The student actively participates and engages in a variety of learning experiences. The school community supports the student as he/she explores, studies, experiments, discusses, debates, and wrestles with new ideas and concepts. All members of the school community accept, believe in, and work together to fulfill the vision. Come visit us at Winthrop!